Looky looky! I finally got someone to take photos of me. (Thanks, Mom!) Click through for a wingspan view. So, I complained a lot while knitting about working with the Silk Garden, which was alternately slubby and overspun, which makes for some wonky-looking seams. But I think the end result was worth the annoyance. For a while as I was knitting this, I wasn’t sure about the colors — I’m still not enamored of the bright green (you can see it in the front in this photo) and wound up cutting it out of the last couple of balls. But the overall effect is stunning. This is an example of my favorite kind of project: take a simple technique and a gorgeous yarn, and you really can’t miss. I struggled to learn entrelac at first, but there are a lot of tutorials with photos on the web, and after looking at several I finally understood the concept. Once you’ve got that down, it’s just a lot of stockinette, but because of the way it’s constructed (you knit each little rectangle individually), you can really see the progress you make. 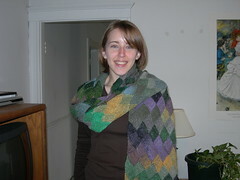 I cast on for this on 12/10/06, and finished it entirely — blocked & fringed — on 2/13/07. She is so warm and has lovely drape, I’m really pleased. She’s very eye-catching, and I’ve gotten lots of compliments at school and those looks you get on the T and out and about. She is a little unwieldy for wearing with winter coats (mind have hoods and I like to seriously bundle up, we’re talking zipped to the neck) but I figured out the trick, and she is a great stand-in when I don’t feel like wearing a cardigan. If you’re thinking of making her, please allow me to point you to Little Knits, which has a great price for Silk Garden. I didn’t get mine here, but this is cheaper than what I found on ebay, and is well below the regular retail price. < Previous Popped collar? No thanks. oooh … very nice. i want to learn entrelac too but haven’t done it yet. Brilliant! It looks great in and of itself, and lovely on you! Congrats on finishing.